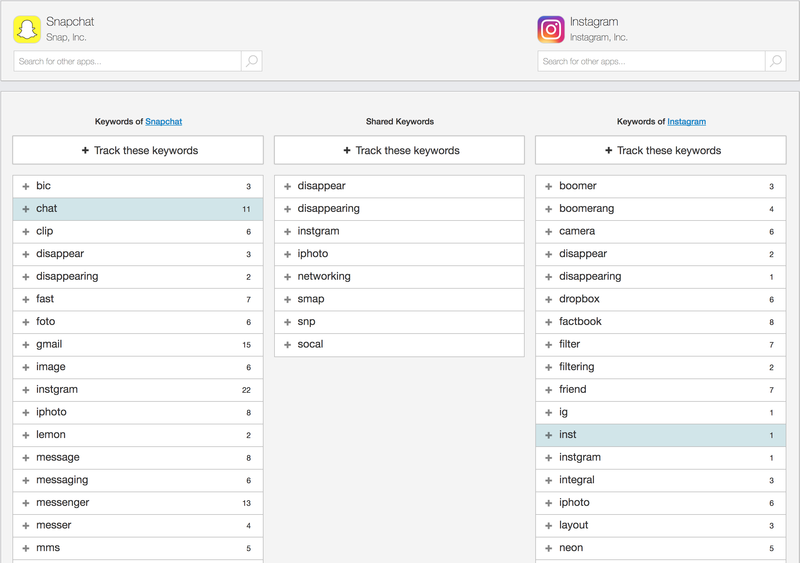 The Keyword Spy feature helps you evaluate competitors’ keywords and keyword selection strategies by pulling in the keywords your app and your selected app are currently ranking for on your selected store. The numbers next to the keywords are the keyword ranks for that particular app and the highlighted keywords appear in the app title. Keywords in the middle column are those shared by the two apps. You can understand your competitors' keyword selection strategy compared side-by-side to your own apps' strategies. You can track these keywords directly onto the Keyword Rankings feature by clicking on the "+" option or by selecting Track these keywords. The rankings next the keywords are only available to our Enterprise App Intelligence Users.